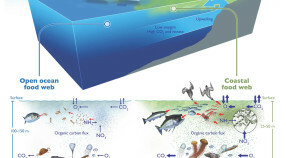 Sedi ment traps collect small particles that sink down from the surface waters of the ocean. When researchers bring the tubes back to the surface, they filter the particles out of the saltwater then study the chemical and biological properties of these particles. The samples are freeze-dried, weighed, and analyzed for salt-corrected inorganic carbon content and total carbon content, from which organic carbon content can be calculated. The top of the trap has a plastic baffle, which prevents large objects from entering the trap and potentially clogging the funnel. Most sediment traps are moored in one location, but Lagrangian sediment traps drift with the currents. MBARI’s Controlled, Agile, and Novel Observing Network (CANON) Initiative is an interdisciplinary effort that utilizes smart, autonomous devices designed to cooperate with each other to collect oceanographic information.